There are accommodation providers on the island to suit all tastes and budgets. Here are a selection, listed alphabetically. If you’d like further details, simply click on the name to be taken directly to their website. A n organic sustainable croft based in the north of the island, Eigg Organics offers a variety of accommodation options, including a traditional Mongolian yurt, a bothy and a camping area which has been voted as one of the Top 10 Campsites in the UK by The Guardian. Offering 22 beds as well as a 2 bed self catered annexe, Glebe Barn has stunning views over the sea to the mainland mountains. Located in the centre of the island, this beautiful building is one of the cosiest hostels in Scotland. 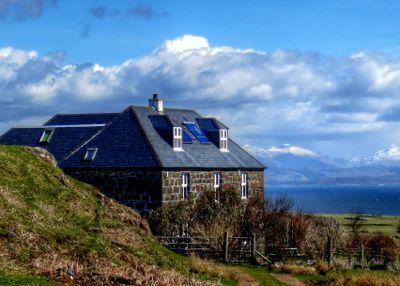 A stunning property overlooking Laig Bay and the Isle of Rum, Lageorna offers both B&B and a self catered cottage. Known for extremely high quality dinners, there’s a 4* restaurant on site offering some of the finest dining views in Scotland. Located right on Laig Beach, the bothy is a luxurious and contemporary open plan space with a spectacular view of the Isle of Rum. Perfect for family beach holidays. A grade ‘B’ listed farmhouse where JRR Tolkien is believed to have stayed gaining inspiration for his books from the magnificent scenery. Sleeping up to 8 people there’s plenty of space both inside and out. Relax on the deck with the fabulous views after a day on one of the two nearby beaches – what more could you want!! http://www.macquarriescottage.co.uk/A beautifully presented cottage with years of history, having been handed down the family line for generations, the cottage has everything for a family holiday including a PS3! A simple, self contained space where time will slip away from you; the bothy has everything you need to feel you’ve escaped modern life. With a wood burning stove and outside shower, you can’t help but relax. With a range of accommodation options and an onsite pub, Tigh an Sithean has a homely atmosphere and beautiful sea views. There’s a choice of B&B, a traditional log cabin and the always popular log cocoons. Based in the middle of the crofting community where the livestock roams freely, this is one of the largest self catered cottages on the island. Tigh Eiligh is in easy walking distance of the beaches of Laig and Singing Sands, with views over the sea and cliffs of Cleadale. One of the larger self catered cottages based in Cleadale, this traditional crofting house has a lovely homely atmosphere and stunning gardens overlooking Laig Bay. A little space with big views! This cosy caravan is perfect for couples, located on a croft overlooking Laig Bay. With no electricity, it’s ideal for getting away from everything and simply enjoying the views and the cosy wood burning stove.